With all the calamities that have befallen NASA over the past few years, it's good to know that something is going their way. The Mars rovers, Spirit and Opportunity were supposed to run for about three months, an estimate they've long since surpassed. 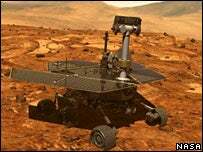 Now, in their astounding sixteenth month, Spirit and Opportunity are destined for a software upgrade. The new algorithms will allow them to search through their photos, and select the best examples of Mars windstorms and dust devils to send back to mission control in order to increase the productivity of research. "The idea now is to collect as much data as the instrument can, analyse them onboard for features of specific interest, and then down-link only the data that have the highest priority," [Rebecca Castano of the Jet Propulsion Laboratory] told BBC News. Currently, the rovers are allocated time to look for clouds and dust devils, which may or may not appear - they are naturally transient events. And getting humans to sift the images is time consuming.